Often people concerned about hair loss are faced with the problem that hair is falling out or not enough of it is growing. But for others the problem is caused by hair breaking. When hair is very brittle it's vital to take care of it properly to extend its lifespan and let it grow to a reasonable length. There are several different reasons why hair can become brittle. It can be a sign of medical problems, especially affecting the thyroid, or it can be caused by certain types of medication. Brittle hair can be made worse by too much exposure to the sun or to chlorine in swimming pools, but these things won't usually cause serious problems by themselves. 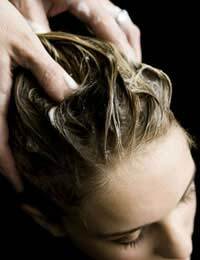 One of the most common causes of brittle hair is too much bleaching. Bleach can be present even in dark shades of hair dye. If you have brittle hair it's important to be especially careful when cleaning it. Water draws nutrients as well as dirt out of the hair and can make it much more fragile. Try not to wash your hair more often than once a week. Dry hair doesn't get dirty as easily, so this won't do it any harm. When you do wash it, don't rinse it for longer than you absolutely have to. Ordinary shampoos can be very hard on brittle hair and should be avoided. Make sure you use a gentle shampoo designed for Dry Hair. Rub it in gently and don't worry if your hair tangles as you do so. You should wait until your hair is dry before you try to work the tangles out, and then you should do so carefully, starting from the end of the hair. Never blow dry brittle hair – heating it makes it much more likely to break and can cause damage. For the same reason, you should avoid using hair irons or straighteners. It's better to pad it dry with a soft towel than to rub. If you wind a towel around it, make sure the weight of the towel isn't putting a strain on the hair. It's vital to use plenty of conditioner when you wash brittle hair, but the best treatments are generally those that stay on for long periods of time. Many Greek and Middle Eastern speciality stores sell oils designed to be worn on the hair for extended periods. Look out for oils containing coconut or banana, both of which are great at softening and strengthening hair. Hair oil tends to smell strongly and can make your hair look greasy, which may not suit your look, but if you massage it in before you go to bed you can rinse it out again in the morning. You should only need to treat it like this once every week or so to see a distinct improvement. If you make sure there's plenty of oil close to your scalp, it will nourish the roots of the hair and help it to grow in better condition. For those with oily hair, find out how to ensure your hair stays in top condition by reading our feature Caring For Oily Hair on this site. I totally disagree with 'You should wait until your hair is dry before you try to work the tangles out' NO NO NO NO NO.... come on... this makes no sense. If you try to detangle hair when dry, the hair shaft is rough not smooth, therefore causing friction when combing. The hairs to catch onto eachother with every movement of the comb and cause damage and breakage... It may seem like the brush/comb is going through no problem, but the damage is occurring at a microscopic level... check your brush or comb, or your lap for the proof! You will see nothing but broken ends!!!! You should ensure your hair is wet, use a conditioner and gently work through any tangles with a wide-toothed comb. The conditioner ensures the strands of hair slide across each other, detangling withoutany damage or breakage, whilst the conditioner helps your hair to retain moisture, warding off brittleness until the next wash. I have naturally brittle hair, and this is how I maintain/grow it. Hope this helps.